The glycemic index, or GI, of foods relates to digestion, blood sugar and energy. Each food has a unique score on the glycemic index scale. If you are diabetic, trying to lose weight or your doctor recommends that you watch your blood sugar level, you need to know the GI score of foods. Lower scores affect your blood sugar less. Even though baked potatoes and boiled potatoes are the same food, the way you prepare them changes their GI score. According to Harvard Health Publications of Harvard University, a 150-gram baked potato has a glycemic index of approximately 85, though that number can vary somewhat. A 150-gram boiled potato has a glycemic index of approximately 50. The same weight of instant mashed potatoes has a glycemic index of 85. Sweet potatoes and yams have lower glycemic index than baked potatoes. A sweet potato is about 61, and a yam, about 37. The glycemic index is a scoring system that ranks foods from 1 to 100. The number represents how quickly the body breaks down the food during digestion and transforms it to basic glucose. One hundred represents pure glucose, which is a substance your body uses for energy. It takes your body longer to digest foods with lower scores. Dieters or people looking to lose weight should eat low-glycemic index foods because it you feel fuller longer, you are less likely to overeat. Monitoring your intake of foods in terms of their glycemic index may help prevent diabetes. When you eat a meal with foods of a high-glycemic index, such as baked potatoes, your blood glucose levels elevate more quickly than if you ate a low GI meal such as yams. A blood sugar spike causes an excessive secretion of insulin. According to the Linus Pauling Institute of Oregon State University, high amounts of blood glucose and insulin secretion likely contribute to a loss of the pancreas' ability to secrete insulin, leading to diabetes. 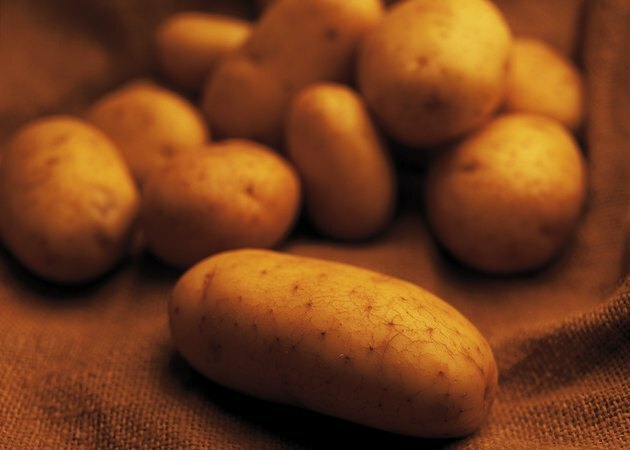 Many different factors can affect the GI scores of potatoes. Where potatoes are grown, what kind they are, if the are hot or warm, whether they are pre-cooked or not are all examples of conditions that affect scores. A study published in the "Journal of the Diabetic Association" in April 2005 tested the effects of cooking on the glycemic response of North American potatoes and found significant results. Pre-cooking Russet potatoes before boiling lowers their glycemic response, but has no effect on white potatoes. A boiled potato has a lower GI score if eaten cold than hot. The study found that boiled red potatoes eaten cold had a score of 56, but boiled red potatoes eaten hot had a score of 89. Should I Eat a Baked Potato When Trying to Lose Weight? Can Carrots Raise Your Blood Sugar?